Scalia interview in New York magazine: The conservative justice reveals his isolation from anyone who doesn’t agree with him. 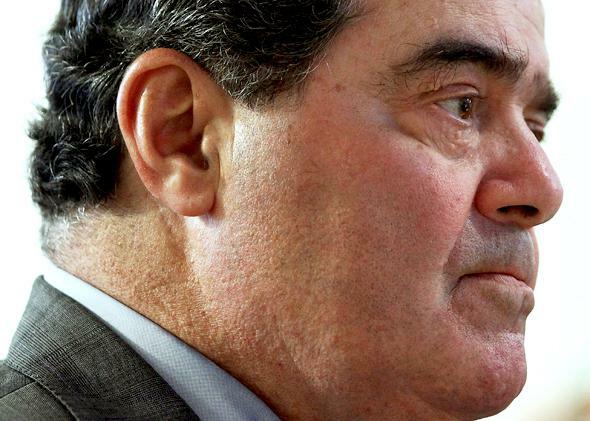 The Scalia interview reveals his remarkable isolation from anyone who doesn’t agree with him. No man is an island. Except maybe Antonin Scalia. Justice Antonin Scalia is burning up the social media world today with a big, free-ranging interview he gave Jennifer Senior at New York magazine. In it, Scalia pretty much out-Scalias himself yet again. Highlights include his objections to the coarsening of modern discourse, his fondness for Seinfeld, the rationale behind his fiery dissents, and a rather remarkable discursion about the devil. But beyond the wacky stuff and the bombastic stuff and the typically unrepentant poke-in-the-eye stuff (including his insistence that he doesn’t hate homosexuals) and the Freudian slip about the “Nazi soup kitchen,” what’s glaringly in evidence throughout the piece is the way he has managed to shutter himself off from the world of his critics and intellectual opponents. He seems a bit like a man living on a tiny remote island of the Supreme Court, and even on that tiny island, he’s forever more alone. Scalia himself notes that something has changed about Washington: “When I was first in Washington, and even in my early years on this court, I used to go to a lot of dinner parties at which there were people from both sides. Democrats, Republicans. Katharine Graham used to have dinner parties that really were quite representative of Washington. It doesn’t happen anymore.” When Senior asks him what was “the last party you went to that had a nice healthy dose of both liberals and conservatives?” Scalia replies, “Geez, I can’t even remember. It’s been a long time.” But then Scalia also seems oblivious to the ways in which he himself might be playing a role in the polarization and rancor that has literally brought the capital to a halt. But it’s not just liberal media Scalia cops to avoiding these days. He shuns the State of the Union every year because it is “a childish spectacle.” He isn’t sure he has any gay friends, but insists that “I have friends that I know, or very much suspect, are homosexual. Everybody does.” When asked by Senior if any have come out to him, Scalia says, “No. No. Not that I know of.” Stop and consider, for a moment, how difficult it would be in a major American city in 2013 to construct a social world in which you might not know anybody who’s openly gay. And, perhaps most tellingly, when Scalia needs to get “outside the Beltway with people of the sort I had never known before,” it’s to hang out with hunters who “live in the woods. Give ’em a gun, they could survive in the woods on their own.” (This is precisely what Justice Clarence Thomas does when he undertakes his summer NASCAR tours.) In other words, when Scalia craves ideological diversity, he goes out and meets real Americans who hate shrill liberals as much as he does. Scalia is at pains to say that none of the hunters he hangs out with are lawyers. Or very few. With the exception of his old friend Ruth Bader Ginsburg (of whom he says, “if you have low expectations, you’re not disappointed,” when they don’t agree with your ideas), Scalia seems to have virtually completely immunized himself from contact with progressive ideas, progressive arguments, and progressive progressives. Although he is clear that he likes to have at least one socially liberal clerk against whom he can test his ideas. So it’s going to be easy to read the new interview as an indictment of Scalia’s tiny political bandwidth. He only reads two papers! One of them is the Washington Times! He only listens to a.m. radio! He thinks intellectual diversity consists of giving equal time to the Federalist Society and deer hunters! He doesn’t like the nastiness of Washington or the shrillness of the Washington Post but feels it’s incumbent upon him to write “sharp” dissents. Oh! And he’s never met anyone openly gay! When Senior apologizes for the perceived disrespect, Scalia doubles down: “I was offended by that. I really was.” This may just be Scalia acting out. But it also serves to illuminate the extent to which this interview encapsulates the nearly complete polarization of political discourse. She can’t believe this man (or any man in 2013) has grandchildren who still think homosexuality is morally wrong. He can’t fathom that she’s never met anyone who believes in the devil. Jump back Thomas Mann and Norman Ornstein. This really is Even Worse Than It Looks. Part of this is probably generational. When Scalia suggests he doesn’t know anyone—especially “ladies”—who uses foul language, you can practically hear Senior’s eyebrows clang against the ceiling. Part of it is gender, to be sure. But at least a part of it is the absolute polarization of American life: the complete intellectual silos that are our neighborhoods, our media, our friends, and our intellectual sparring partners. The Scalia interview is an amazing tell into all the ways Washington has changed, and it’s about more than just the guest lists at Katharine Graham’s parties. We don’t know the other side anymore. We don’t even know anyone like the other side anymore. We can’t even believe those people exist anymore. And maybe this is really what the devil’s been up to.